AO MAKHAM, PHUKET: Open trials for Phuket FC soccer team have been postponed two days until November 14. The trial will now take place at the FIFA Tsunami Memorial Center at Ao Makham this Saturday from 4pm to 6pm. 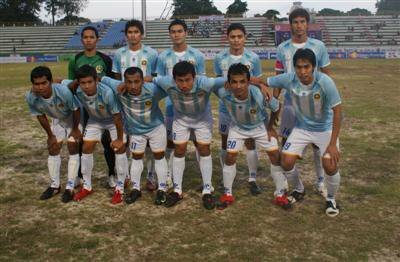 Phuket FC are looking to bolster the squad ahead of the 2010 season. Several players, including Thai premiership veterans, have contacted the Phuket Gazette with a view to playing for the Sea Dragons next season. Phuket FC finished their maiden season second from the bottom in the Thailand Regional Division Two South, winning just twice all season and failing to record a victory at Surakul Stadium. Organizers are hoping the trials will attract a number of quality players from around the island as Phuket FC tries to achieve promotion next year. “There is going to be work done to improve the pitch and the squad will be much stronger next year,” said Eam Thavornwongwongse of the Kata Group last week. Anyone interested in representing the Sea Dragons should attend the trials next week. Foreigners are welcome to try out. For more information about Phuket FC contact Daniel Ogunshakin by email or visit the Facebook group ‘Phuket FC Supporters Club’.